Chills + malaise + quote theme = "meh." I guess it's a timely electoral theme for New Yorkers, but nobody's going to the polls in Chicago so politics are not much on my mind. It's a quote by MARIO / CUOMO: "YOU CAMPAIGN IN / POETRY. YOU / GOVERN IN PROSE." One clue really jumped out at me. 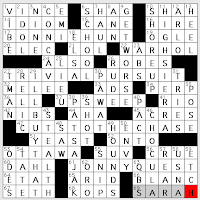 A couple weeks ago on the Cruciverb-L list, there was a heated discussion regarding nurses, their roles, the way they're clued in crosswords, and whether they have a valid complaint when they don't like a NURSE clue. Well! NURSE is clued as [Surgeon's assistant]. 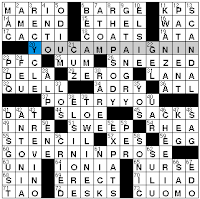 I guess that puts Will Shortz squarely in the camp of nurses = assistants to doctors, though a couple doctors I talked to accord nurses a considerably higher standing. • KWANZAA is a [December celebration] that jacks up the grid's interest level with a K, Z, and final double A. • SNEEZED gets a trivia clue: [What Fred Ott did in the first movie to be copyrighted]. Was 2D: [Flu fighters: Abbr.] supposed to be a tricky clue leading you to enter the incorrect (but technically far more correct) answer, CDC? The AMA's members may treat people with the flu, but the AMA itself, is it doing much on this issue? I haven't heard of anything. I feel like I haven't seen RAREE in a puzzle in years, though it used to be more commonplace. The clue is [___ show (carnival attraction)]. Dictionary says archaic: "a form of entertainment, esp. one carried in a box, such as a peep show." •17A. BONNIE HUNT [Daytime talk show host]. Since 2008. •27A. TRIVIAL PURSUIT [Game in which players collect wedges]. Never played the game, never knew about the wedges. That's a piece of trivia to tuck away. •47A. CUTS TO THE CHASE [Makes one's points without delay]. This is my fave of the theme fill as it's both active and concise. •61A. JONNY QUEST [Animated TV adventure series of the '60s]. Nupe. Never heard of it. But with both a "J" and a "Q," what's not to love? And yes, another piece of trivia to tuck away. More interesting (for my money...) is the aforementioned non-theme fill/cluing. There's the sequential "Down" pair, for starters, opposites GET WORSE [Take a downturn] and SHORE UP [Bolster]. Then, there are those KOPS or ["Keystone" lawmen], who could always be counted on to be part of a MELEE [Free for all]—especially when on a hunt, in pursuit, on a chase or a quest. Did they ever use HOUNDS [Hunting dogs] when trying to nab the PERP [Criminal in copspeak]? I kan't rekall... STEALTH [Cat burglar's asset], however, was never their strong suit. Oh, and from the same early era of film-making, there's The Little Tramp and his CANE [Prop for Chaplin] (who made his first appearance in a Keystone comedy). HIGH SIERRA [Bogart/Lupino film of 1941] is the one in which Bogart spoke the line: "I wouldn't give you two cents for a dame without a temper." Why does that make me smile so? But to end on a genuinely "sweet" note, we get "chocolate x 2" today with Roald DAHL [Wonka's creator] (Willie Wonka being the candy-maker in Charlie and the Chocolate Factory), and (bane of mothers/delight of dentists everywhere) [Count] CHOCULA [(Cereal brand)], making every day Halloween. 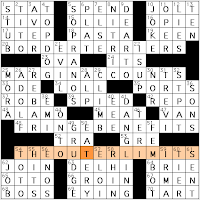 The theme is THE OUTER LIMITS, and the other three theme entries have outer "limits": BORDER TERRIERS, MARGIN ACCOUNTS, and FRINGE BENEFITS. I think. Or they just begin with words that mean "limit." Usually an "outer" theme will break up a word more than just plunking an S at the end. 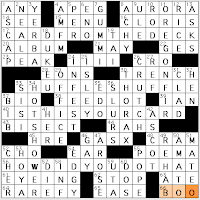 For more on this puzzle, I refer you to PuzzleGirl's L.A. Crossword Confidential post. Matt Jones's Jonesin' crossword, "Uh-Oh, It's Magic"
I don't quite get this theme. 1A/17A spell out ANY / CARD FROM THE DECK—[what you're instructed to pick]. What magician is going to use those words, "Pick any card from the deck"? It's "Pick a card, any card" in standard parlance. SHUFFLE SHUFFLE is the [Sound effect now heard after putting it back]. Wait, SHUFFLE isn't a sound at all. "IS THIS YOUR CARD?" is the [Question I hope to be correct]. Wait, it's not that the question should be correct. The answer to the question should be affirmative. "HOW DID YOU DO THAT?!?" is the [Response I'm really hoping to get], but "BOO!" is the [Response that, odds are, I'm probably going to get]. Wait, who boos someone if they successfully pull out the right card? Or is the implication that the person doing the card trick has completely failed to pull it off? Hmph. Time to do some editing before the virus returns me to the sofa.